Kind Dining is comprised of 9 dining services training modules divided into 3 sections. Each module runs approximately 60 minutes. Typically we teach one section (3 modules) in a half-day or 4 hour time block. Class size works best with at least 10 participants per session, with a maximum of 16 to stay within time frames. Take a look at just how important the experience of dining is in the lives of your residents. Discover how important you (the servers) are to them. Learn new ways to make their dining experience even better. Work on building a winning team. Explore what the company needs to do. Module 1. Making a House a Home – Creating community. Click to view sample page. 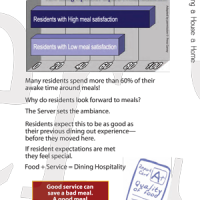 Describe your relationship to residents and how that affects their dining experience. Translate the company’s mission statement into something you can get behind. Explore the Science and Psychology of dining. Module 2. Feel the Change a Comin’ – Respecting the aging process. Describe how our aging population has changed and its impact on you. Discuss the states of aging and how these affect the lives of residents. Explore methods of caring for residents that protects their freedom and dignity. Module 3. What You Bring to the Table – How to be successful as a server. Identify with a new communication model, called L.E.A.R.N. Explore 10 important characteristics and which ones you’re strongest in. Module 4. Setting the Meal – Knowing how to be ready to serve. Examine how to set up the dining room according to a detailed checklist. Check–and adjust if necessary–your own appearance and attitude against a list of personal readiness items. Identify set-up requirements based on the menu. Module 5. The Symphony of Service – Applying what you know correctly. Practice taking food and beverage orders in a way that ensures you meet expectations. Handle and carry glassware and utensils hygienically and efficiently. Anticipate the needs of diners and accommodate their needs before a request is made. Module 6. If I only had a heart – Caring to become better servers. Demonstrate courtesy and friendliness to residents throughout their meal. Acquire the chit chat skills required to start conversation. 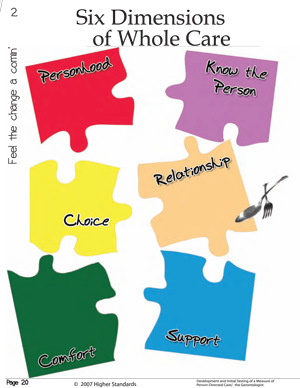 Become skilled in recognizing–and responding to–residents emotional state and needs. Module 7. Emotion Control – Dealing with the hard parts of serving. Discover that you are responsible for customer service. Review and practice the L.E.A.R.N. model of communication. Practice dealing with emotional situations with residents. Module 8. 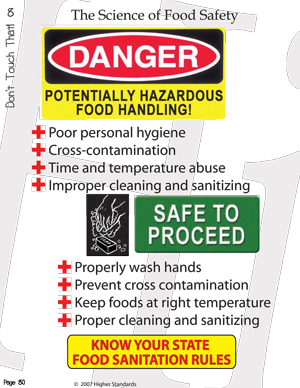 Don’t Touch That – Preventing food borne illness. Examine common foodborne illnesses and the key to preventing their spread. Take a test on what foods are most at risk. Maintain personal health and hygiene to ensure food safety. Module 9. Polishing Service – Respecting the company that hired us. Notice opportunities around you for improving the dining experience. Take initiative to make improvements by personally changing things you can control. Solve issues and implement changes as a team.